When I found out Whole Foods Market 365 was coming to my neighborhood, my entire being lit up with JOY. 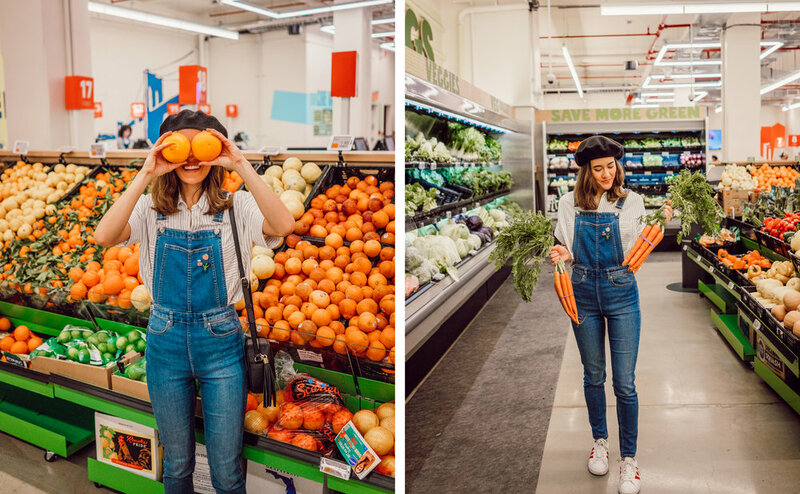 I'll be the first to admit that a large part of my happiness stems from having access to a healthy and affordable grocery store nearby. When I moved to another part of Brooklyn, I gave up the convenience of my neighborhood Whole Foods, which was a challenge for me. I'm SO happy with the new 365 Market - I love how it is more affordable, and yet I still have access to the brands I love like Kite Hill and Kombrewcha. Since learning I am allergic to a slew of ingredients like wheat, soy, corn, and eggs. I've become a proud kitchen ninja. 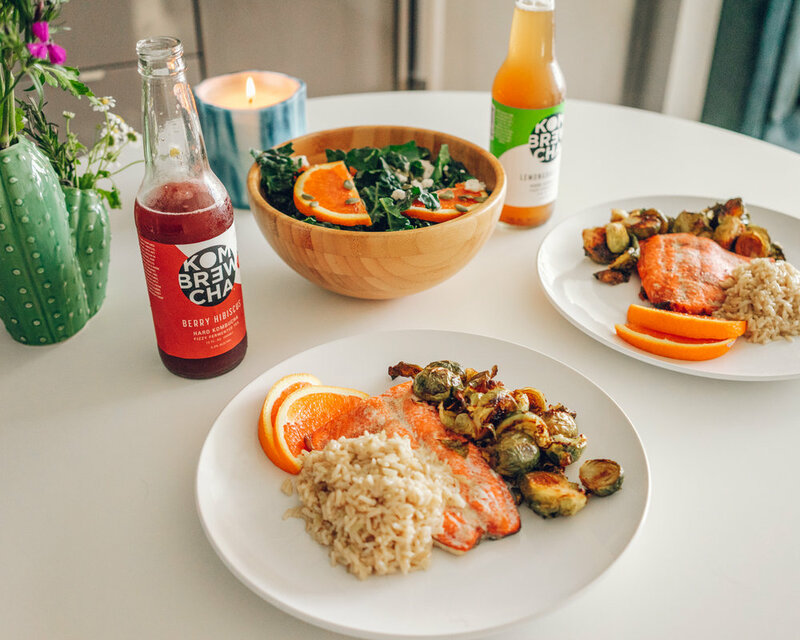 So, I wanted to share my go-to meal for a healthy, allergen-friendly, and easy date night dinner for two! This meal is free of Gluten, Dairy, Soy, Corn, and Eggs. All of these items can be purchased at Whole Foods Market 365! Majority of these ingredients can be found in the produce section, seafood department, and bulk section. Drinks, Drinks, DrinksKombrewcha*My FAVORITE. It's hard Kombucha, which is perfect for me since my body doesn't tolerate alcohol well. Wash and roughly chop kale. Put aside in a big salad bowl. Cut blood orange into thin slices and toss it on top of kale. Throw in a handful of pepitas, crumble up Kitehill Almond Cheese, and sprinkle dressing lightly. Mix together. Salmon: Preheat oven to 400 degrees. Pat thawed salmon filets dry with a paper towel, then rub salmon with avocado oil. Place salmon skin-side down on cast iron and season with garlic powder, sea salt, and black pepper. Save room on cast iron for brussel sprouts. Crispy Brussels: Cut off stems and chop brussels in half. Toss lightly in avocado oil and balsamic vinegar (just enough to make them shine). Sprinkle on garlic powder, sea salt, black pepper, and drizzle a bit of honey. Place brussels on cast iron to surround the salmon. BAKE for 15 minutes. Take out salmon after 15 minutes, but keep the brussels in for another 5-8 minutes depending on how crispy you like 'em. Coconut Rice: Boil 1 cup of brown rice with 1 cup of coconut milk and 3/4 cup of water. Add a pinch of salt. That's it. That's my favorite meal in a nutshell! If Andrew loves it, then I'm sure you will too. It takes about 20 minutes to make, with maybe 10 minutes to prep. So, not bad eh? Cheers to a happy date night! This post was written in partnership with Whole Foods Market 365. All thoughts and opinions are always my own. Thank you for supporting me and the brands I love!